The poor garden this summer! Extreme heat, no rain, blazing sun, then sudden torrential storms with incredible winds. All this and more have left gardens in a sad state. It’s time for a rescue. Here’s my list of fixes and tips to help reclaim their health and beauty. Trim out all dead and diseased branches on bushes and trees. If left alone this could attract insets and/or further spread the disease. Start by clipping out dead branches on bushes and trees. 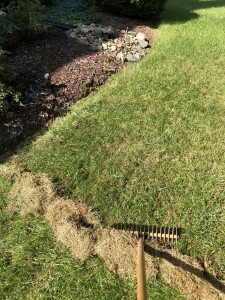 Next (depending on how much is affected), trim out the bad parts, or completely cut back perennials as well as annuals. Make sure to collect and recycle your trimmings. 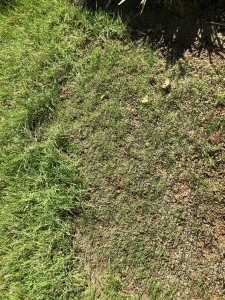 In the humidity which comes with late summer, it is easy for fungus and insects to infect large clippings on the ground. Adding them to a compost pile will heat them so this doesn’t happen. In my yard, I am completely cutting back the foliage on all of the daylilly, yarrow, iris, and lamb’s ears, which will resprout fresh new foliage and look terrific until frost. I will trim out many small branches on the Japanese hollies and junipers, and a significant number of dogwood limbs, too. 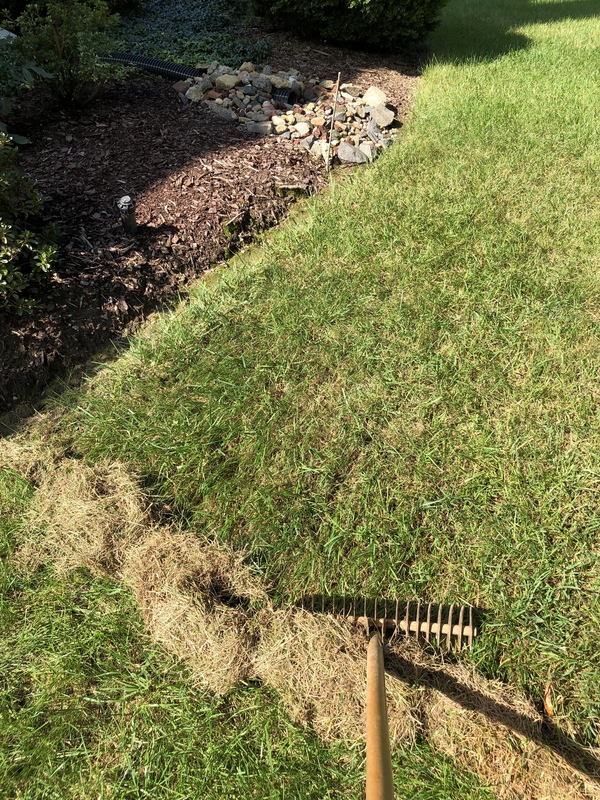 I suggest raking through the mulch to make sure that it has not compacted too much, and if you are in a drought area, start watering your foundation bushes with a soaker hose if you haven’t already. 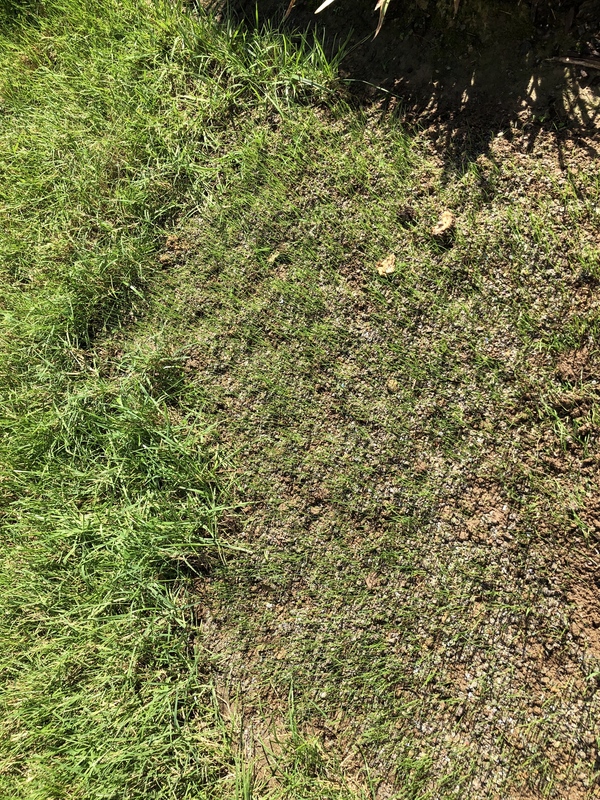 When your lawn goes into a dormant state due to severely high temperatures combined with a drought, it is best to wait until temperatures have receded before resuming watering and/or feeding. 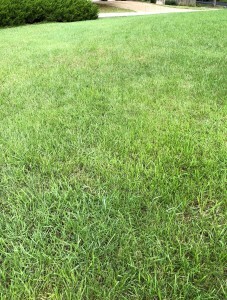 The grass in the yard has gone completely dormant here due to the lack of rain and the heat. Rather than stress it by trying to force it to grow, I will let nature tell me when it’s time to regenerate. 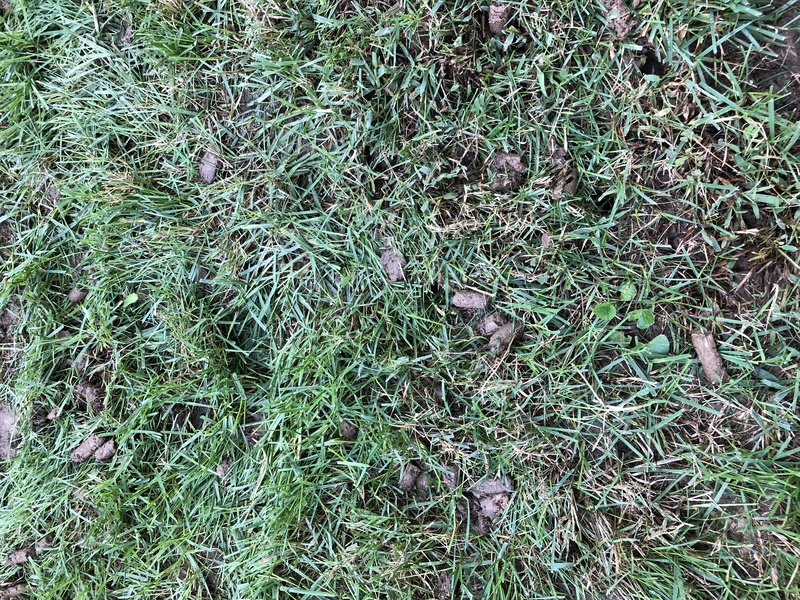 I must say that in all the years I’ve been gardening, I don’t remember a year that has stressed the grass so much. I caution against adding any mid-season fertilizer this year. 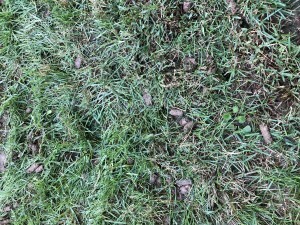 It may help to lightly add a 1/2 inch of compost to the lawn to help protect the roots. Until the temperatures are back below the 90’s I am wary of doing much else. As soon as the temperatures are lower I will start watering unless we receive significant rainfall. The flowers that I have in pots this year are tried and true. I planted only geraniums, which I know to be more drought tolerant than many other flowers. Tip: plant two pots for every one that you need in an exposed focal area like the front door. 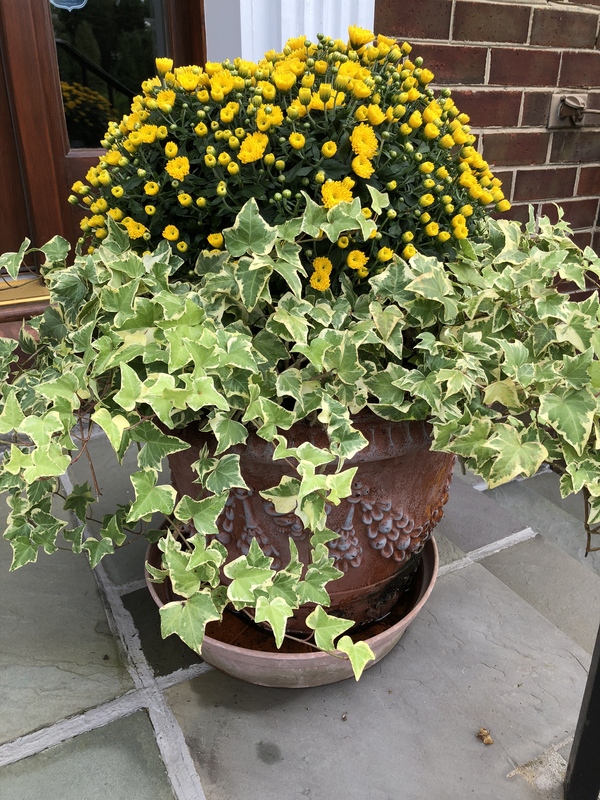 Put one pot on the front porch and one in a less exposed area (under the deck in my case). Rotate them back and forth each week. That way they are given a break from the harshness of the weather extremes and are able to stay healthy. Also be sure to turn your pots at least 1/4 rotation each week, so that they don’t grow crookedly towards the sun. This is especially true if you have potted evergreens that you display year round. This is an example of "sucker" branches. 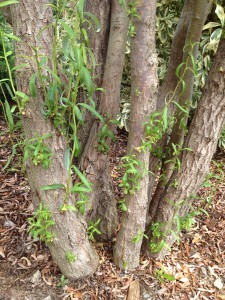 They are ugly and can actually draw the nutrients out of the tree if left alone. It is best to keep them trimmed out. Many trees will develop “sucker” shoots from the trunks or branches this time of year. They are very unattractive and provide no benefit to the tree, and they can actually harm the tree if left alone. I like to take a sharp pruner and trim them out. You may need to check every month or two for a re-occurrence. This is also the perfect time to trim back wisteria. 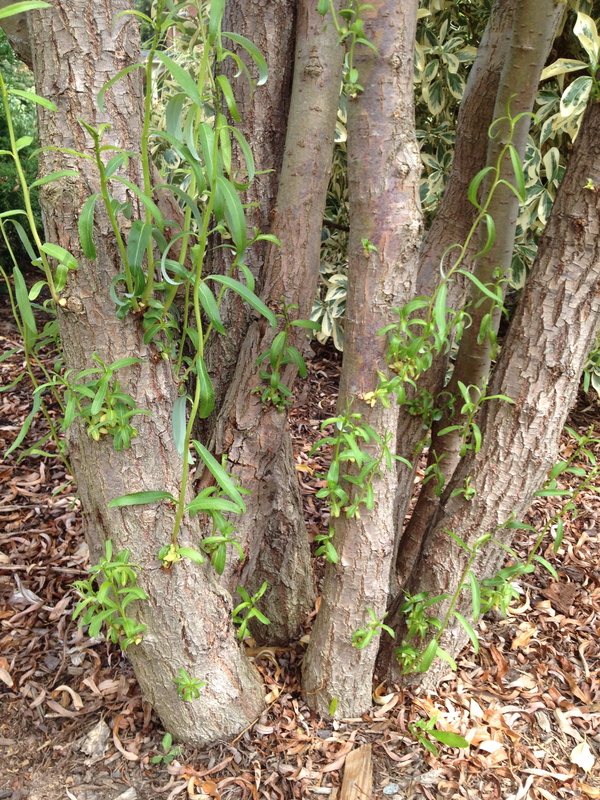 (Remember January and July for hard pruning on wisteria.) Mine grows as much as 3 to 4 feet in a week, so I do lots of mini-prunings to keep it in shape. If you are growing chrysanthemum or sedum, this is also the last time for pruning back the height before blooming. I like to take mine down by a third. By doing that you will have many more blooms on a much stronger, more compact plant which will be less prone to splitting open in the rain. 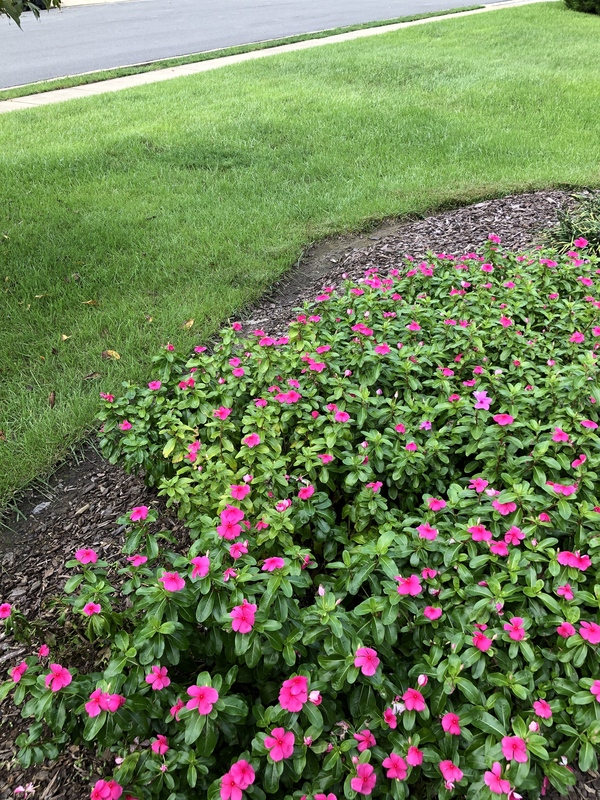 I hope your yards and gardens are surviving this hot, dry summer. If you have any tips you would like to share on this subject, send them along and I’ll be sure to print them. Here’s looking forward to some healthy green color coming back! Triple digit days are with us again! Wow, is it hot out there! This summer so much of the U.S. is under heat advisory. Here in the D.C. area we have set countless records already, and it’s still July. After such a damp early spring we are now getting mudcracks in the garden. I would like to share some advise on watering in these extremes. First- be careful. It is so hot I recommend late evening (8-9 o’clock), or early (pre-dawn to 7 o’clock) watering times. It can actually be harmful to the plants to get them wet in this extreme sun. You can end up with blistering on the leaves and flowers if the sun hits them before the water has dried off. It is also a good idea to drain the saucers on potted plants after an hour or two, if the water has not been absorbed. 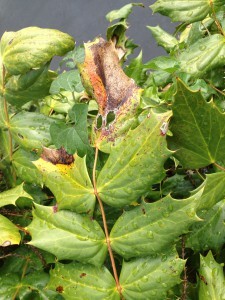 It is easy to end up with fungus and insect larva in the heat and humidity so many of us are experiencing. I like to wear old clothes and rubber flip-flops when I’m out watering, that way I can hose myself off to stay cool as well! A big hat, sunscreen, bug repellent are all good ideas, but I really advise to just wait until the sun has gone down or at very least, has traveled off the garden before I water it. Some watering favorites- 2 Gallon Watering can, Soaker hose, Multi-spray nozzle, Flip-flops and Sprinkler. accomplish everything you need to with out even having to brave the heat. With a soaker hose you get the water exactly where you need it on the root zone, so you aren’t wasting a bit of precious water. 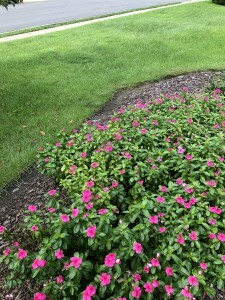 Even more water conscious would be a drip irrigation system, with individual emitters for each plant, but these systems are not as easily changed each year for different planting formations. That brings me to the lawn, and whether or not to water or let it go dormant. I think that totally depends on your long term weather forcast. If you are experiencing just a short term dry spell then I would recommend watering. 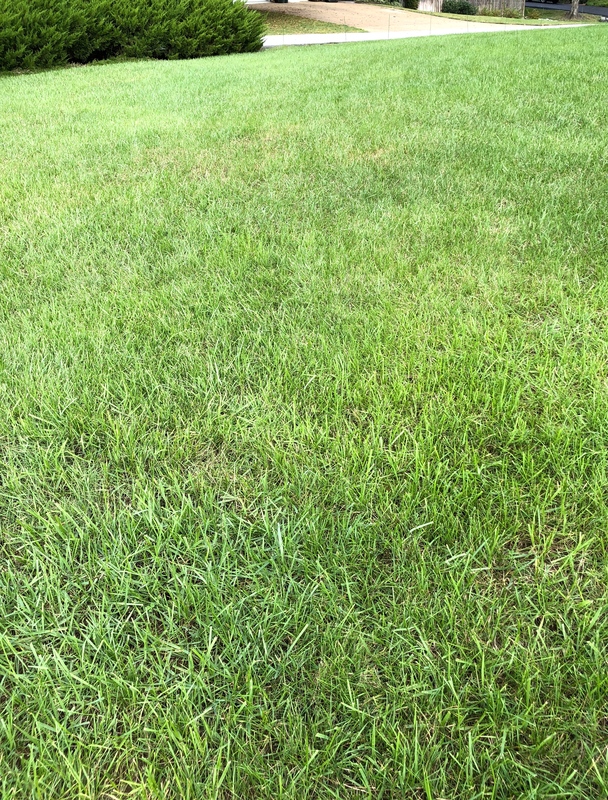 Most turf needs approximately 1″ of water/rain per week. 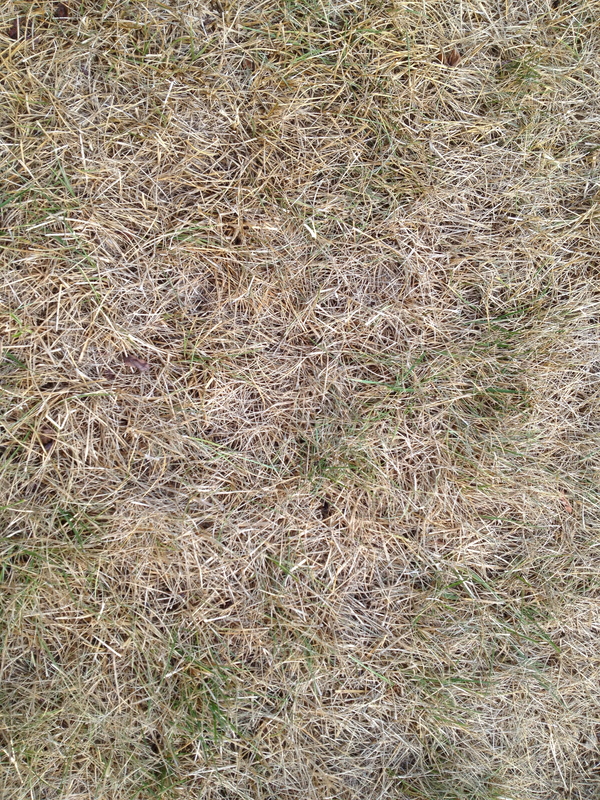 If you long term forcast is an extended drought, I would suggest letting your lawn go dormant. It is healthier for the lawn to allow this, because it struggles too much when it is too hot and dry. Don’t worry, it will come back in the fall, and look healthy and green again. Trees however should be deep watered at least every 2 weeks, if they are small, tender, or newly planted within the last year. I just let the hose trickle, so that the water sinks in immediately, or use a soaker hose coiled around the tree a few times, letting it run for about 20 minutes to 1/2 hour. The best tip I can offer is to think cool thoughts, and imagine yourself in snow. Imagine yourself in a cool place, it actually is proven to lower your temperature. We will have cool weather before you know it!